This testimony is like a breath of fresh air. I work at home online and generally don't see many people but about once a week. Last night we went to a chicken BBQ fundraiser the local FFA (Future Farmers of America) hosted. It was so sad for me to see several overweight young students. All I could think about is what their quality of life will be in 20 years. When this testimony of a 90 yr. old came across my desk, it felt so good to know as a Shaklee distributor I have the products and education to make a difference in the lives of people young and old. My Dad was VERY unhealthy in his sixties before Shaklee. Then Shaklee came along and my mother made sure he took generous servings daily for years. Dad is 90 years old now and still runs his lumberyard, sees his lady friend daily and is very sharp mentally. When Vivix came along, my Dad did not think he needed it. I gave him the "talk" about the need for it and gave him the "talk" again several months in a row to convince him he needed it daily. Now he is absolutely convinced and takes it every day without fail. These are his results. By the way, Dad takes no medications at all, his health kit is Shaklee nutrition which he eats daily. His eyesight is better, his skin looks younger (many people think he is in his 60's as he really looks that young), his heart is stronger (he had a some irregularity in his heartbeat at his last checkup, his heart is beating stronger and with a more regular beat now), but the one that Dad is really thrilled about is the lack of pain in his stomach. He lifted something quite heavy about five years ago and felt something tear. He had blood in his urine so visited the doctor and was checked with several tests and nothing could be found. But since that time he has had an uncomfortable feeling and he cannot lift anything very heavy, sometimes I think my Dad thinks he is 20 again. He was so excited to share with me a couple of weeks ago the pain is gone from whatever the problem was. He can lift again with no pain. Something to think about. 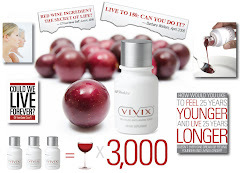 Vivix (Anti Aging Resveratrol) protects and repairs the DNA of the cell. This is EVERY cell in your body! Can you think of any adult that couldn't be helped by this product? By the time we turn 18 their probably isn't anyone immune to a damaged cell in their body at one time or another. Just like this "Dad" 5 years ago something happened in his stomach that didn't repair itself until he had a little help from Vivix. The human body if given the right nutrients has the ability to heal itself. I've been blessed to have the ability to educate and help folks understand we all have choices about our body. We can choose what we put in or on it. The choice is yours, my job is to bring you the information to make an informed decision.